TRIVIA of Noh : Q44 : Can Noh actors wear glasses on stage? 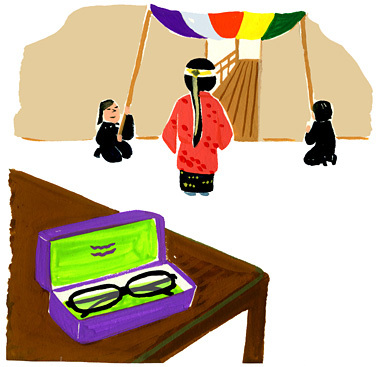 | Home | Trivia | Q44 : Can Noh actors wear glasses on stage? Can Noh actors wear glasses on stage? Noh stages are considered to belong to a different world. Therefore performers avoid taking in items from the present world. They remove any accessories, including rings or watches. They even take off their glasses. Some of the performers even remove their contact lenses, though the audience would not find if they were on the eyes. Performers remove their glasses or accessories not only because they have rules and considerations in their appearance on stage, but also because they are trying to make themselves well prepared to perform. As positions are determined even for musicians and reciters, not to mention for actors, people on stage will be able to generate a performance automatically as long as they keep their own positions in it. If an actor with poor eyesight goes on stage without glasses, he can act without a hitch because he overcomes his bad sight with all of his day-to-day efforts.